Note: I realize the Brewers made this transaction to keep fresh arms in the bullpen. But that doesn’t mean it was the right move. After four games and six innings, the Milwaukee Brewers felt it was necessary to give up on Rob Wooten in favor of a reliever who posted a negative WAR in 2014, didn’t make the team in ’15 and was designated for assignment just three weeks ago. This paints a clear picture as to just how bad things are going in Brew Town. Brandon Kintzler is the new arm in a bullpen that desperately needs some help. As of May 7, the Brewers’ bullpen ranks 25th in ERA (4.27), 29th in FIP (4.64) and 28th in WAR (-0.3). They’ve given up the second-most home runs in baseball which has resulted in a 1.46 home run per nine innings ratio. The Brewers have already shown Tyler Thornburg the door, with Wooten becoming the latest victim. But Kintzler is far from the savior the Brewers need. Milwaukee gave up on Wooten too quickly this season, a fact they’ll soon realize once Kintzler starts getting the call. Let me be clear. Wooten has been horrendous thus far. His ERA is north of 11 and his FIP is just south of 7. He’s even been quite lucky this year. And yet here I am, trying to convince you he should’ve been given a longer leash (I mean, the guy was only allowed to get 18 outs before he was canned). For some reason, Wooten has lost his sense of the strike zone and, in turn, has become wild. He walked just eight batters in 34.1 innings a season ago, but has already walked six this year. He actually has given up more walks than he has hits. His abundance of walks is one of the very few reasons why sending him down makes sense. It’s better for him and the Brewers if he can work out his strike-throwing issues down on the farm instead of on the big stage. Another aspect of Wooten’s woes (what a good name for a band) is batters are no longer hitting the ball on the ground against him. His ground ball rate sits at 37.5% after 53.3% ratio in 2014, and while that’s not good news, Wooten has somehow limited batters to a .250 batting average on balls in play. This is even more fascinating considering he has allowed a 58.8% hard-hit percentage (highest among Brewers). If both the lack of ground balls and the high hard-hit rate continue, Wooten’s BABIP would obviously rise considerably. He can’t stay this lucky for long. Wooten’s not a strikeout pitcher, meaning he relies a lot on groundball outs. I can only imagine what his ERA would look like if his BABIP was higher. So, maybe Wooten does need a little time in Triple-A to get some things sorted out, but it doesn’t change the fact that Kintzler’s still not the answer. Kintzler has been OK for the Sky Sox this season in extremely limited action because of a DL stint (6.35 ERA and 2.42 FIP), but I don’t really care about what minor league numbers look like for a player who would be considered a veteran at the major league level. In 2012, Kintzler was a slightly above average reliever. In 2013, he was damn good. In 2014, he was the fifth-worst reliever in Major League Baseball. To my surprise, the Brewers tendered Kintzler a contract before spring training, and then not to my surprise, optioned him to Triple-A before the season started with general manager Doug Melvin saying he needed to work on “commanding his pitches” and “getting back his sink.” Apparently, he’s done just that. Otherwise, I don’t think Kintzler would’ve gotten the call. There’s a chance that Kintzler can return to the pitcher he once was, but the odds of that are small. Either way, the Brewers bullpen stinks with or without him. I hope Wooten can fix his control problem, because I believe he can be a useful bullpen piece. And who knows, maybe a team in need of relief help will come calling. This entry was posted in Bullpen Banter and tagged Brandon Kintzler, Milwaukee Brewers, Rob Wooten on May 8, 2015 by Justin Schultz. Since 2013, the Milwaukee Brewers have had 17 pitchers throw at least 60 innings — Wily Peralta, Kyle Lohse, Yovani Gallardo, Marco Estrada, Matt Garza, Mike Fiers, Jim Henderson, Tyler Thornburg, Brandon Kintzler, Francisco Rodriguez, Rob Wooten, Tom Gorzelanny, Alfredo Figaro, Jimmy Nelson, Burke Badenhop, Will Smith, Donovan Hand. Now that you have just read a long list of people who throw baseballs for a living, I want you to guess which one has the lowest Fielding Independent Pitching over that time span. Hint: Look at the title of this post. That’s right. Rob Wooten owns a 2.87 FIP and is the only Brewers member with a FIP under three. Still, while his FIP has been excellent, his earned run average has been less than stellar (4.35), meaning Wooten has had poor defense behind him, bad luck, or is just a pitcher that will always outperform his ERA. It also could be a combination of all three. For example, if Wooten forces a ground ball that an average defensive third baseman could grab (Aramis Ramirez is not an average third baseman), the blame can’t and shouldn’t lie with Wooten, despite what the box score may say. The fact of the matter remains that Wooten has pitched better than the story his ERA tells. Because of that, I think Wooten will be an effective reliever and maybe one of the best out of the Brewers ‘pen in 2015. I have three reasons to back up my hypothesis. In 2014, pitchers threw an average of 3.80 pitches per plate appearance. Wooten, meanwhile, threw an average of 4.03 pitches. He spent too much time on each hitter and was well above league average in terms of Pit/PA. Now, strikeout pitchers — something Wooten is not — usually throw more pitches than non-strikeout pitchers, so where are Wooten’s extra pitches coming from? Walks? Nope. 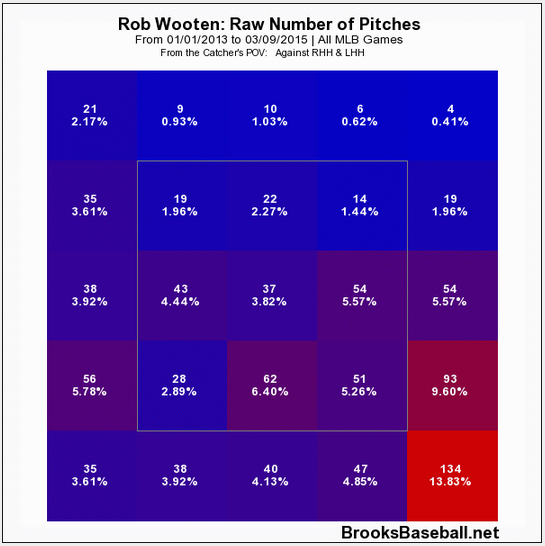 Wooten walked just five percent of batters and had a K-BB% of 14.3%. As long as Wooten keeps his walks to a limit, his Pit/PA should go down and end up closer to league average. And if that happens, more favorable results will follow. Wooten doesn’t give up home runs, has an excellent groundball rate, and rarely issues free passes, and that’s because of his pin-point accuracy. He hits the bottom of the zone more often than the New York media criticizes Alex Rodriguez. Just take a look at his zone profile. Wooten has thrown 1003 pitches in his career and exactly 134 of them have landed in the bottom right corner of the strike zone (catcher’s POV). There’s very little chance a hitter can do much of anything with that. More than likely, they’ll hit it into the dirt. Batters hit .239 when they hit a grounder in 2014. But against Wooten, they hit .293 (17 for 58). That’s a fairly high average for ground balls, which is why you can expect some regression toward the mean in ’15. The same can be said for line drives, as league average BABIP on liners was .683 while Wooten allowed a .778 average. Overall, Wooten allowed a .380 BABIP, which was the highest average among every reliever with at least 30 innings under their belt last season. Don’t expect that to happen again. This entry was posted in Bullpen Banter and tagged Milwaukee Brewers, Rob Wooten on March 10, 2015 by Justin Schultz.